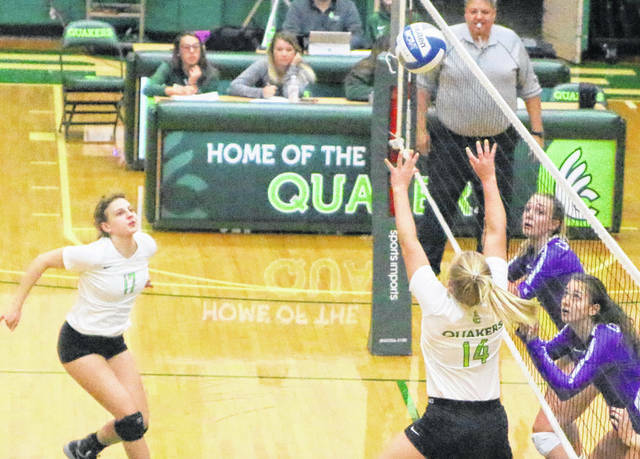 Ending a 59-match Ohio Athletic Conference losing streak, the Wilmington College volleyball team defeated Capital 26-24, 25-18, 23-25, 25-16 Tuesday at Hermann Court’s Fred Raizk Arena. Wilmington (8-19 overall, 1-7 OAC) concludes its 2018 season at John Carroll Saturday. The Quakers last OAC win came against John Carroll on Oct. 8, 2011. On Tuesday, neither team started well at the net but Wilmington took advantage of a late Capital service error to win the first set. In a close second set, WC led 16-15 when Summer Wilbur started a run with an ace. Four Capital attack errors and a Karrah Wind kill made it 22-15. Wind had two kills later in the match then Jillian Wesco had a kill to end it and give WC a 2-0 lead. In the third set, Wilmington led 20-18 late when Meghan Koch recorded a kill but the Crusaders fought back to win it and pull within 2-1. Wilmington trailed 14-10 in the fourth set but Wesco had a kill and a big service run to put WC on top 19-14. Mariella Szrom and Morgan Loomis had kills for WC then Wilbur served out the match to end the seven-year conference drought. Wind finished with 11 kills for WC while Szrom had six. Wilbur and Jacie Koontz combined for 28 assists. Wesco, Koontz and Karley Schlensker led the defense with a combined 30-plus digs. Wind, Szrom and Koch played well at the net on defense.